Black Bears , pine trees and a cozy mountain cabin are featured on the original design of the Bear Lake Quilts by Donna Sharp. 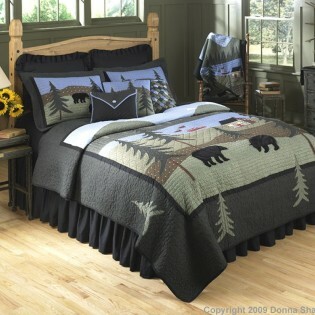 Shades of green and sky blue are complimented by black and dark gray in this rustic bear quilt. 1 quilt, bed skirt with 18" drop and pillow shams (1 with twin, 2 with queen and 3 with king). 1 quilt, 1 bed skirt, standard pillow shams (1 with twin, 2 with queen and 3 with king) euro shams (1 with twin, 2 with queen and 3 with king), 1 valance/runner and decorative pillows (1 with twin and 3 with queen and king).